Along with the entire House of Representatives and 37 U.S. Senate seats, voters this November will be going to the polls to elect thousands of state senators and representatives. Eighty-eight of the nation’s 99 state legislative chambers are up for election this year. And while these state legislative elections are less glamorous and attract far less media attention than elections for federal offices, their results will have important consequences for the direction of public policy in the states. In the states, just as in Washington, there are often dramatic differences between the approaches favored by Democrats and Republicans on major policy issues such as taxation, education, transportation, and the environment. Social issues such as abortion and gay marriage have also produced intense partisan conflict in many states. In addition, the results of this year’s legislative elections will also determine who will control redistricting. The process of drawing new state legislative and congressional district lines could affect control of state legislatures and the House of Representatives for the rest of the decade. So what can we expect in November? In his excellent overview of the outlook for this year’s state legislative elections in last week’s Crystal Ball, Tim Storey explained that Republicans are expected to make significant gains in the state legislatures just as they are in the U.S. Senate and House of Representatives. That’s because two factors that favor Republicans in this year’s congressional elections also favor Republicans in the state legislative elections: 2010 is a midterm election under a Democratic president and Democrats have made substantial gains in the 2006 and 2008 elections that have left them defending many seats in districts that have traditionally favored Republican candidates. It is well known that the president’s party almost always loses seats in the House of Representatives and usually loses seats in the Senate in midterm elections. What is less well known is that this pattern also extends to state legislative elections. Since World War II, the president’s party has lost seats in 15 of 16 midterm elections with an average loss of between 250 and 300 seats. The president’s party has also lost state legislative chambers in 14 of 16 midterm elections with an average loss of 8 chambers. While the tendency of the president’s party to lose state legislative seats and chambers in midterm elections is very clear, the size of these losses has varied tremendously. In 2002, in the aftermath of the September 11th terrorist attacks, Republicans actually gained over 100 seats and 5 chambers. On the other hand, in 1958, Republicans lost almost 700 seats and 20 chambers and in 1994, Democrats lost almost 500 seats and 20 chambers. The outcomes of midterm state legislative elections are strongly related to the outcomes of midterm U.S. House elections. Figure 1 displays the scatterplot of this relationship for the 16 midterm elections since World War II. 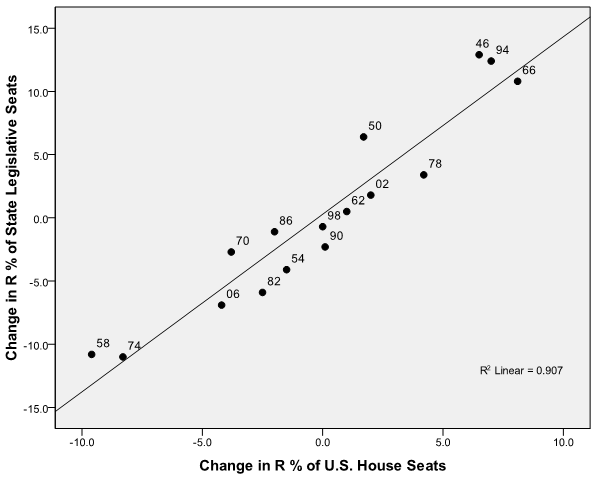 The correlation between the state legislative and U.S. House results is a very impressive .95. Elections that produced large Republican gains in Congress such as 1946, 1966 and 1994 also produced large Republican gains in the state legislatures. Similarly, elections that produced large Republican losses in Congress such as 1958, 1974 and 2006 also produced large Republican losses in the state legislatures. Source: Data on state legislative elections provided by Tim Storey, National Conference of State Legislatures. Data on congressional elections compiled by author. The data displayed in Figure 1 strongly suggests that state legislative elections are influenced by the same forces that influence congressional elections including the national political climate at the time of the election. My previous research on congressional elections has indicated that the outcomes of House and Senate elections can be predicted with a high degree of accuracy based on a midterm election variable, the number of seats each party is defending and the national political climate, measured by the results of the Gallup generic ballot question. In order to test the hypothesis that state legislative elections are influenced by the same forces that influence congressional elections, I performed a regression analysis of the outcomes of all 33 elections since World War II using the change in the Republican percentage of state legislative seats as the dependent variable and three independent variables: the Republican percentage of state legislative seats prior to the election to measure exposure to risk, a variable indicating whether an election was a Democratic or Republican midterm, and the Republican lead or deficit on the Gallup generic ballot question in early September of the election year to measure the national political climate. The results of this regression analysis are displayed in Table 1. Note: Dependent variable is change in Republican % of state legislative seats. The results in Table 1 provide strong evidence for the influence of national political forces on state legislative elections. In addition to the effects of the seat exposure and midterm election variables, the results of the Gallup generic ballot question have a very strong impact on seat swing in state legislative elections. A ten point swing in the generic ballot margin, such as going from a 5 point Democratic lead to a 5 point Republican lead, would be expected to produce a shift of just over 3 percent of the nation’s state legislative seats, or approximately 225 seats. This would have important political consequences since there is a very strong relationship between state legislative seats and chamber control: the correlation between the two is .92. On average, an increase of 2 percentage points in a party’s seat share can be expected to produce a pickup of one legislative chamber. The late Democratic House Speaker Tip O’Neill’s famous statement that “all politics is local” clearly requires modification based on the evidence presented in Table 1. While individual legislative races are shaped by local as well as national forces, the evidence presented here demonstrates that national forces strongly influence overall party performance in state legislative elections. Specifically, the results of the Gallup generic ballot question, along with the number of seats each party holds going into an election and the party of the president in midterm elections can be used to predict overall seat swing and chamber control in state legislative elections. Given these findings, what can we expect in 2010? Since the only unknown at this point is the results of the Gallup generic ballot test in early September, we can calculate the expected Republican seat gain in November and, from that, the expected number of legislative chambers Republicans would control after the election, depending on the results of the Gallup question. Those predictions are displayed in Table 2. Source: Tim Storey, National Conference of State Legislatures, and data compiled by author. Because 2010 is a midterm election with a Democrat in the White House and because Democrats have made large gains in the last two elections, Republicans are almost certain to make substantial gains in the 2010 state legislative elections. Those gains could range from a minimum of about 200 seats and 5 chambers to a maximum close to 500 seats and 13 chambers depending on national political climate as measured by the Gallup generic ballot question. However, since the results of the Gallup generic ballot question have averaged very close to a tie over the past several months, the most likely scenario at this point appears to be a Republican gain of between 300 and 350 seats which would be expected to give the GOP control of between 44 and 46 legislative chambers, an increase of 8-10 over their current 36 chambers. A shift of this magnitude, while leaving Democrats as the majority party in more than half of the nation’s 98 partisan legislative chambers, would dramatically increase Republican influence over both state public policy and redistricting.